Walking through Auckland after leaving the boat, I catch myself constantly reaching forward. As if there will be a brass handrail next to me, to brace myself on. But on land I do not always need to brace myself. It has only been a few hours, but already it seems impossible that I walked up the ladder to the doghouse at all hours of the day. The brass handrail always there. Gleaming. The pro-crew visited us for a night at the Leigh Marine Lab were we were finishing up our coursework. It was bizarre, to have so many of us gathered together in a place solidly grounded. Already, the Seamans and our voyage had drifted far away from the immediacy of the academic crush. But it was wonderful to see them again. One last game of cards. A chance to pretend to read each others’ fortunes and to quietly commiserate and support each other after the election. Outside of the lab, the ocean rushes into the rocky cliffs we are perched on. The tang of the sea is strong. I do not remember when the smell of ocean became so normal that I stopped smelling it. But here that I can smell it once again drives home how far and separate I am already from our weeks on the Seamans. I have yet to be asked too many questions by people at home. Even so, I do not know how I will answer them. I can only know I have brushed something big and important. Pivotal maybe. That some decision, made now and maybe re-made in the future could bring me back. To the waves. To the boat. I hope that, in the mean time, my Minnesotan lakes won’t seem to small. Our time in Leigh is like a long drawn out goodbye. I can’t quite handle it. You call your parents in New Zealand. Your father pauses, and you know he will ask about the boat. And you know you do not have the answers. You are not prepared for the questions. You cannot decide if you want them to come or not. Perhaps they will make it seem all real again, or perhaps they’ll only make it clearer how far away the ship already is. This trip has so often been one of surprise and wonder and of equally a test of my endurance, of my spirit, of my confidence. But did it actually happen? Already my precious bunk seems too far away. What evidence to I have but for a new vocabulary? A grown sense of self-assurance? An appreciation for situational awareness and the direction of the wind? They gave me a pin at the end of the academic program. A pin. What the hell am I supposed to do with that? In Wellington, when a handful of us reunite, all we talk about is the boat. The games we played, the storms we met, the beaches we sat in the sun on. It’s the ultimate you-had-to-be-there conversation. We’d be the worst company at parties. Talking about things few people have done or seen, using strange vocabulary. We talk fast, the inside jokes flowing one after another. On the flight home I watch the new Star Trek movie and start when Captain Kirk tells another character he “has the con.” That’s real ship talk there. And his commands, the talk on the bridge sounds exactly like what you’d hear on my ship. Of course, of course. But I didn’t expect to find it there. You see an article about tiny houses online. And spend a long time looking at the pictures of compact kitchens and well designed living spaces. For the first time ever, you can truly picture yourself living in such a small space. You’ve learned how to do that well enough on the Seamans. At Thanksgiving, I am asked three times in a row about food on the boat. And about how sea sick I got. These seem like boring questions to me. But perhaps it is because I know what life on the boat was like, and my family does not. Not really. But of course we ate. And the food was great. Truly, not just because we worked hard. And yes, you eventually got used to the waves. But what about the other things–no one asks about lines or going aloft. No one asks about swimming. Or volcanoes. Or about all the islands or who I might have met. Or if I loved it. They remember the shark, but not the whales. And maybe it is because I did not tell them enough to begin with. Perhaps the message did not make it across all the branches of my family tree that I would be other places than New Zealand. That I’d be doing more than just sailing and staring at the sea. I tell them about flying fish and they ask all about their biology and why they fly. I do not have those answers. This entry was posted in Uncategorized on November 27, 2016 by Paige. In August, I wouldn’t have said I knew how to sail. I had sailed. On small boats on lakes in Minnesota. And I knew enough to duck under the boom when you tack and to take slack our or put it into a line when I was asked. But for the most part, I was just a passenger who participated when called upon. The beginning of our time on the ship was incredibly overwhelming. There was so much to learn, but not learn so much as become so completely familiar with you no longer think about it. The location of all the lines on the ship. What to do and where to go when a mate gives an order. How to make a line fast. How to do any of the myriad of science deployments. How to log weather and determine the true wind. How to steer. How to eat on gimbaled tables and how to move when everything refuses to stay still. How to sleep when the seas clamor against the hull. The middle of our journey saw us students shadowing our watch officers for some time. This was phase two. Each student got the chance to see and hear first hand everything a mate does or thinks through throughout a watch. They learn about keeping the log, details of sail handling and points of sail. So by the time we left Suva, everything made just a bit more sense. And collectively, as a group, we pretty much understood what was going on throughout the six hours of watch. Just in time for the third phase of the voyage to start: The Junior Watch Officer phase or, as we call it, JWO (pronounced JAY-wo). This was where each student would be assigned a watch where they’d be the JWO or corresponding JLO in the lab. Kind of like hitching a ride on our watch officer’s mate’s license, the JWO would be responsible for running the deck. They would ensure boat checks happen, time and call sail handling for science, and report to the captain, among other things. My JWO shift was an evening watch. Science was going to do a Nueston tow at 2330. The wind was out of the north for the most part. And we were sailing under the stays’ls and the tops’l. At first, watch was calm, totally under control despite my nerves. And then our captain strolled into the doghouse and informed me that I’d won the JWO Lottery. We were going to set the rafee, a rare enough thing to do and even more special to do while JWO. 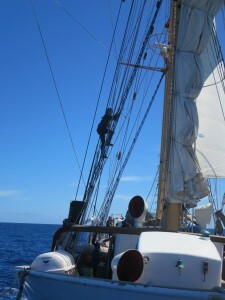 The rafee is a triangular sail that lives at the very top of the fore mast. It’s a fun sail to set—we call it the party hat and with the right wind it helps us go real fast. Only moments after setting the rafee, rumors started circling in a way that can only happen on a boat (lightning fast and no one knows who started them or how) that maybe the wind was such that we’d set the course eventually. 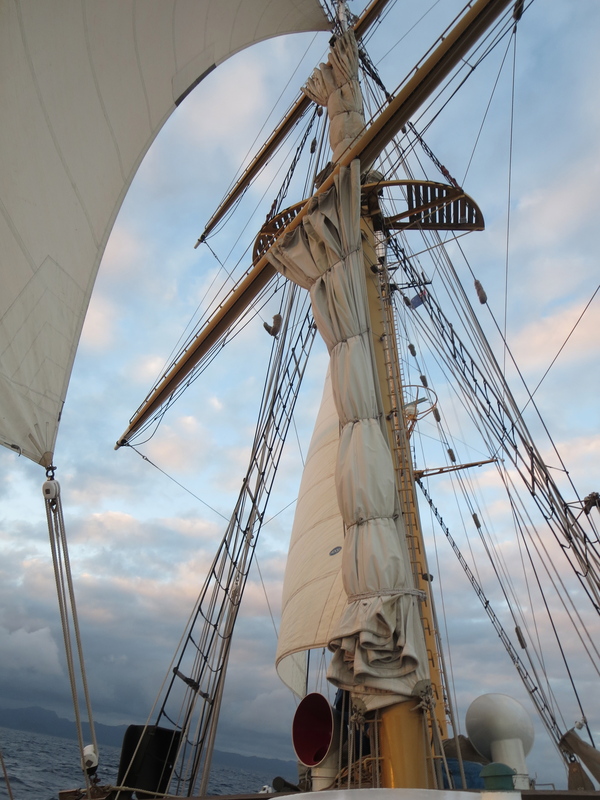 (The course being a square sail that lives at the bottom of the foremast.) When asked about it, the captina just spread out his arms, shrugging. A non answer if I’ve ever seen one. Sure enough, later in the watch, he came back into the doghouse with the new that we indeed were going to set the course—a sail that none of the students had even seen set yet. So the night dissolved into some chaos of setting and striking sail. We set the course (which requires striking the forestays’l) just in time to have to stike the rafee, the course AND the tops’l for science. And then setting the forestays’l again to keep us moving. Our nueston tow requires that we move at about 2 knots. With all those sails we had been making about 7 knots. And once the Nueston tow was out of the water, off we went again to set the course and the tops’l again. A night of setting and striking sail—new ones and familiar ones. I called the sails I knew, the tops’l and the stays’ls. Our watch officer called the setting of the course—not just because it was a new sail to us, but because it was a pretty complicated operation. Even so, I was surprised by how much I knew and how much I could rely on the rest of my watch to have my back during my time as JWO. After all, if I didn’t know something they probably did know it. The JWO phase threw us into something we doubted we were prepared for, and then we ran with it, doing the best we could and learning each step of the way. This entry was posted in Uncategorized on November 26, 2016 by Paige. Science happens every day on the boat. From hourly recordings of ocean water temperature and salinity, current direction and magnitude and much much more, to daily deployments that consist of hydrocasts or neuston tows, we’re continuously gathering data on the biological, physical, and chemical nature of the waters we’re passing through. At it’s always quite a bit of fun, but, towards the end of the trip, the stakes were raised when we began deep net tows, a stack of three nets on our hydrowire, each trailing behind out boat at a different depth up to 200m. I was on dawn watch right after we pulled up our first deep net tow, and the salty smell of sea life covered the deck, pouring down through the galley hatch into the salon to my sleepy nose At first, I was very puzzled, and a little alarmed. Such a strong smell of brine was foreign to below decks. For a second I thought that something might be wrong, but then I remembered that deep net tows had started that evening. On the science deck, i was greeted with a pile of nets–the massive circular 2 meter net, the smaller though still circular and awkward 1 meter net, and the familiar neuston net, which we had been towing throughout the trip. And buckets full of cool organisms. A Watch, having dawn watch, were responsible for processing all of the things collected in the nets. Six hours of lab work later, we’d sorted our tons of shrimp, fish larvae, salps, ctenophores, and an eel like thing amongst a whole lot of biomass. Luckily enough, the next night, the deep net tows continued. I was in that evening watch and was the Junior Lab Officer for that time, meaning I got to run the deployment. Which was cool because deep net tows are crazy and new but also a bit intimidating because, well, I’d never even seen one done before. After getting the low down from our assistant scientist, we and and my two watchmates in lab started setting up. We retrieved the three nets and got out all the gear we use to trail them through the water–the clamps to attach them to the hydrowire, and something that looks like a little torpedo with blades that spin around to measure how much water the nets pass through, and a mini CTD. We also prepped the hydrowire and set up the signs informing our shipmates that the science deck is off limits. Doing deep net tows requires a lot of communication between science and the deck–to make sure we are going the right speed and to make sure people are watching out for the nets. We let out so much wire that the stack ends up trailing behind or off to the side of the stern of the boat. And the actual deployment involves bursts of activity and periods of wait time. The first net is put into the water with a weight below it to drag it below the ocean surface. We quickly let out the wire and the net falls away from the boat. After we’ve let out enough wire, we lasso it back to us to clamp on the next net. Rinse and repeat until all three are trailing in the water. After our first net went into the water, the chief scientist and the first assistant scientist ducked under the lines blocking off the science deck and motioned me to follow them. “What are we not supposed to be on the science deck?” I asked, still unclipping my harness from the rail, which I had attached myself to while wrestling the 2 meter net over the side of the boat. I looked at the wire, which normally streams straight off to the side of the boat and down into the water. This time though, it ran at head hight along the deck, the net pulling it backwards to the stern of the boat. He was right. I didn’t want to be anywhere near there. But we couldn’t have asked for a better night to do a deep net tow. It was one of those few entirely clear nights, where the stars are so numerous, the sky so thickly dark that you can’t help but realize how small you are, just a speck on the ocean on a speck of a planet. When we finally brought them in, the nets emerged ghostly from the water. We upended the contents of the jar at the end of each net into their own pristine bucket. And the real bun began, a 20 minute session of oohing and aahing over the critters he had plucked from the deep. Salps. Ctenophores. Hyperiid Amphipods still inside of salps. Lobster larva the size of our scientist’s palm and clear as glass. A lot of fish larva, and one large fish with a huge mouth. In the complete dark, swirling the buckets causes the bioluminescence to light up, creating great swirls of blue in the seawater. The next watch was going to process of of these treasures, but for that moment they rested in the buckets, spinning and glowing blue. And the smell of them, the brine of things which had never reached the air, cloaked the ship. Later, after turnover, and and a few watch mates lingered on deck, gazing up at the stars still brilliant. More so than ever aware of the strangeness of the sea. It felt incredible and strange to be right there, on the Seamans on the dark ocean. Who was I to haul on a line and to label myctophids?? And how did I get here? And was I really that brave to dream myself into this trip? And if felt correct. Wholly and completely. Because of course I was there. LIke where else could I be but on deck covered in zooplankton and in a spot on the globe where the beauty of the stars is only matched by the glowing orbs that swirl in the water all around us? This entry was posted in Uncategorized on November 23, 2016 by Paige.